The ultimate refreshing side dish. It’s colourful, juicy and so tasty. You can get fancy with toasted almonds, or mustard dressing, however these fresh ingredients really do just shine on their own. Zest the orange. Then peel and segment it – removing as much of the white pith and membrane and possible. Combine the orange zest, oil, lemon juice, salt and pepper. To prepare the fennel – cut off the top stalks (reserving some of the green fronds for later). Cut the bulb in half and cut out the tough core. Slice as thinly as possible. Now combine and fennel, orange segments, and dressing in a bowl. 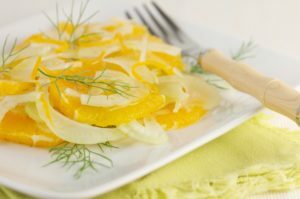 It’s important to dress the fennel as soon as its been cut as the lemon will help prevent browning. Serve on a flat platter and top with some of the green fennel fronds for colour. Note: It is best to buy fennel when it is in season for cost effectiveness and quality.